SP-Series SELF-PRIMED HORIZONTAL PUMPS: side channel pumps, also called liquid ring pumps, are designed to separate air and liquid from emulsion. 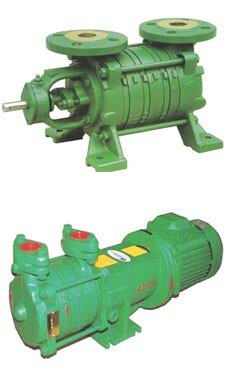 These self-primed pumps have a high priming capacity; multi-stage design enables one or several stages assembly. The discharge pressure is directly related to the number of stages. Therefore, SP-Series pumps achieve high discharge pressures at low rotating speeds with fewer stages compared to multistage centrifugal pumps, thus being more economical in operation.